Living roofsA roof with a covering of soil or growing medium and plants. They tend to be divided into turf roofs with a 150mm layer of soil and sedum roofs with a thinner layer (about 40mm). 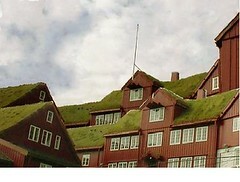 see Living Roofs on houses fall into two basic categories: turf roofs with about 15 cm. of soil and Sedum roofs with about 4 cm. Sedum roofs differ from turf roofs in that they are much lighter and can usually be built with the same type of roof structure that a normal roof would require whereas the weight of 15 cm. of sodden turf requires a heavier, and specially designed structure. Sedums are suculant plants which can withstand long periods of drought on a thin layer of soil. There are many types of sedum with flowers varying in colour from red to white to yellow. There are also several other types of drought resilient plant such as the House Leek family. Living roofs tend to work best between flat and 30° slope although the Scandinavians often go up to 45° using Platon and incorporating reinforcement into the root matrix. They could potentially have a longer life than most roofs as the waterproof membrane is covered by soil and therefore protected, especially from the damaging effects of UV in sunlight. A long term study in Berlin showed that living roofs improved the performance of roof mounted PVPhoto Voltaic. referring to the generation of electricity from sunlight collectors by keeping the air cooler around them. They are less efficient when hot. As mentioned above they are not particularly well suited for rain water harvesting as they tend to absorb quite a lot of water themselves. The idea that they provide thermal insulation is easy to overstate. Earth is not a good insulator and anyway there will usually be a vented space below the roof decking which will be cold. However they are quite good at providing acoustic insulation because of the muffling effect of the soil. They also give good fire protection which may be required by the building regulationsThese are the mass of regulations that cover safety, health, welfare, convenience, energy efficiency etc. in the way buildings are constructed. Not to be confused with Planning consent (which is more to do with whether you can put up the building in the first place). See more on the regulations , depending on proximity to your neighbours. Turf roofs have a history going back thousands of years but took on new life when historically important buildings in Norway and other Nordic countries needed major improvements over the last few decades. To preserve their character they developed a special indented plastic sheet to place beneath the turf to help drain it and to hold the turf in place on steep slopes. Then modern house designers took up the idea. The green roof industry has taken off in the last few years and some suppliers seem hell bent on selling you as complicated and unecological a bit of kit as possible, usually the sort of thing that is more appropriate for intensive roofs. You may get quotes of between £50 and £100 per sq. m. for the living part of the roof. Materials may have to come half way across the country or even from abroad. For most self build situations a much simpler approach is better and this is to use a basic product like Oldroyd Xv Green or Platon in the case of sloping roofs or simply geotextile for nearly flat ones. Then use local soil as a growing medium. Sedum plants are what clog up gutters on farmers’ sheds and are extremely easy to propagate by breaking up clumps of the plants and planting the roots (literally by scattering and raking in). People with sheds and outbuildings are often very happy for you to clear away build-ups of sedum. For nearly flat roofs and those with a slope up to 10º it is only necessary to place a few centimeters of growing medium on a root barrier layer (with a waterproof roof membrane beneath that). Sedums and other drought resistant plants such as sempervivums, saxifrages and small dianthus can then be sown. Rain water simply drains off the surface as it would from a normal roof. Instead of a root barrier layer (which, being plastic, is high in embodied energythe total amount of energy it takes to make a material (or a building). See more on embodied energy) you may be able to acquire discarded nylon or acrylic carpet and this can form excellent protection for the waterproof membrane. it helps protect the roof membrane from shards of broken glass etc. which might get ground in by foot traffic. it helps the roof drain from below and there is a possibility of newly sown sedum washing loose under heavy rainfall before the roots are established if Xv Green is not used. After roots are well established the soil will stay put on their own without Xv Green. Xv Green is designed to retain water in its pocketed profile and this will allow other plants (which need more water than sedum) to flourish. A turf roof is similar to the sedum except that two layers of turf are laid, the lower one up side down, making a combined thickness of 150mm. This is not the sort of thin turf you get from a garden turf supplier. It is considerably thicker and will need sourcing locally. Remember that turf roofs will usually require stronger roof joists than normal to carry the extra weight of the soil and turf. In the two drawings above, the lower edge of the turf and sedum at eaves level is held in place by a line of stones. This can make a decorative effect if they are chosen well. Alternately concrete blocks or railway sleepers may be used, as long as water can drain past them. They will soon get covered in moss and sedum. The plastic land drain in the gutter deals with any soil and growth which may find its way down to that level. (It also prevents leaves clogging the gutter) This works because the run-off from a living roof is much slower than from a normal one so the drain can easily cope with the flow. This all ties in well with SUDS. See why it is a good idea to use timber gutters and note how the roof membrane is carried over the gutter to protect it. Oldroyd do a range of green roof membranes, fixings etc. including ‘turf hooks’ for fixing eaves boards. Hey all, I need some one to advise and install a living roof on top of my garden office which is currently under construction. it is a 5Mx5M building (25m2) and I need to know what level of additional support I will need to be able to support a living roof. any and all advice appreciated. I am wanting to build a 6m x 6m room with a pole support and clay slip infill. What size and far apart should my beams be and what “roof” cover can I use as you write “Sedum roofs differ from turf roofs in that they are much lighter and can usually be built with the same type of roof structure that a normal roof would require” I would love to use easily available bamboo or pallet planks…is that possible? Sedum roof on corrugated cement/asbestos? My garage/wokshop is roofed with corrugated cement/asbestos. It is old and has a reasonably well established flora or lichens and mosses. It is set at around 15 degrees. As it is watertight I’ve no intention of replacing it but am thinking of planting it with sedum to improve insulation in the workshop. I want to avoid plastic sheeting. If I can find birch bark I’ll use that, as the Norwegians did/do. I’ll find a way to strengthen the roof with as little disturbance as possible. Any tips, comments and/or suggestions gratefully received.